You may remember these from your own childhood. They're a perennial family favourite. 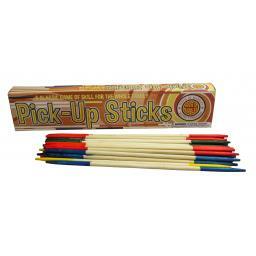 Originally known as ‘spillikins’ and made of ivory or bone, nowadays Pick up Sticks are made of wood. They are as much fun today as they ever were. You need to employ skill - use a delicate hand and take the stripy stick to remove one other stick at a time without disturbing the rest of the pile. Quite a challenge and hilarious fun!